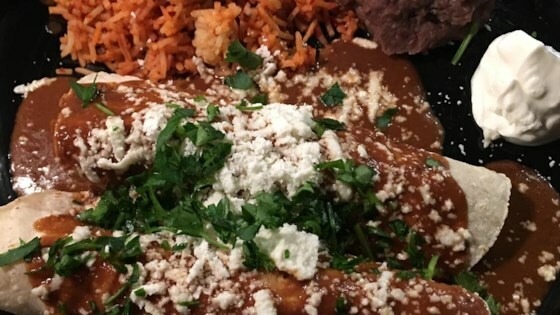 "These authentic chicken enchiladas with mole sauce were inspired by a dish served at Seattle's La Carta De Oaxaca restaurant. Chocolate and dried chiles make a rich and flavorful sauce that tops the moist and tender chicken enchiladas." Melt 2 tablespoons lard in a stockpot. Stir in 1/2 onion, 2 cloves garlic, 1 teaspoon salt, 1 tablespoon cumin seeds, poblano peppers, and Anaheim peppers; cook and stir until onions are soft, 5 to 8 minutes. Add chicken thighs and 4 cups chicken broth, cover, and simmer until reduced, about 40 minutes. Toast guajillo chiles and ancho chiles in a dry skillet on medium-high heat until hot and aromatic, 3 to 4 minutes. Place toasted chiles and tortilla strips in the blender with the hot broth. Press them down so they are fully submerged and soak until softened, about 10 minutes. Blend the chile and tortilla mixture until smooth. Cook tomatoes and tomatillos in a dry skillet on medium-high heat until soft and blackened, 3 to 4 minutes per side. Melt 2 tablespoons lard in a large skillet over medium heat. Stir in 1/2 sliced onion, 5 garlic cloves, 2 teaspoons cumin seeds; cook and stir until onions are soft and golden, 5 to 8 minutes. Add onion mixture to the blender with the chile mixture and blend until smooth. Pour chile puree into a large saucepan over medium heat. Stir in 2 cups chicken broth, salt, sugar, and chocolate. Bring mixture to a simmer; cook and stir until chocolate is melted, about 5 minutes. Toast tortillas in a dry skillet over medium heat until golden and soft, 2 to 3 minutes per side. Fill each tortilla with 1/3 cup chicken mixture. Roll and place seam side down on a plate. Continue with remaining tortillas, 3 per plate. Top each trio of tortillas with 1/3 cup mole sauce, 1 to 2 tablespoons chopped cilantro, and 1 to 2 tablespoons queso fresco. The mole came out way too tamato-y. The chicken filling for the enchiladas was especially good, though.